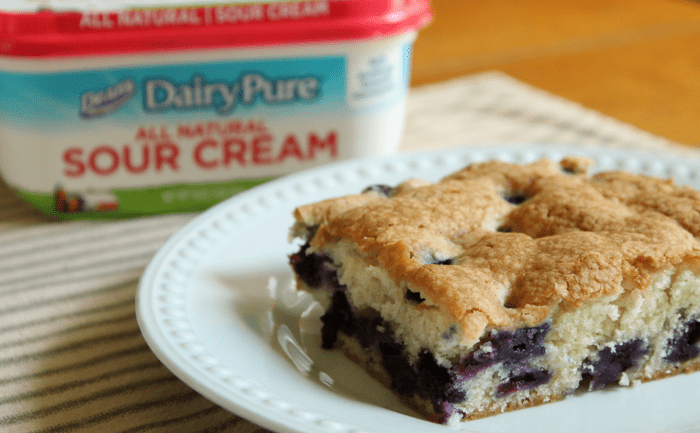 Disclosure: This Blueberry Sour Cream Cake Recipe post is sponsored by DairyPure Sour Cream and The Motherhood. All opinions are my own. Summertime is the perfect time to eat simple desserts that are full of seasonal fruits. When the berries are plentiful and at their best, there’s nothing better than baking an Easy Berry Cobbler, with fresh blackberries, or Easy Strawberry Shortcake with fresh strawberries, to serve my family. This snack cake is perfect to throw together for a quick dessert in the evenings, or as a a sweet treat in the afternoons. I also like to cut a square to pack inside my husband’s lunch, because it’s easy to wrap up and eat without a mess of frosting sticking to the wrapper. Adding sour cream to baked goods not only keeps them super moist, but it also makes them taste very rich without adding a lot of extra fat to the recipe. 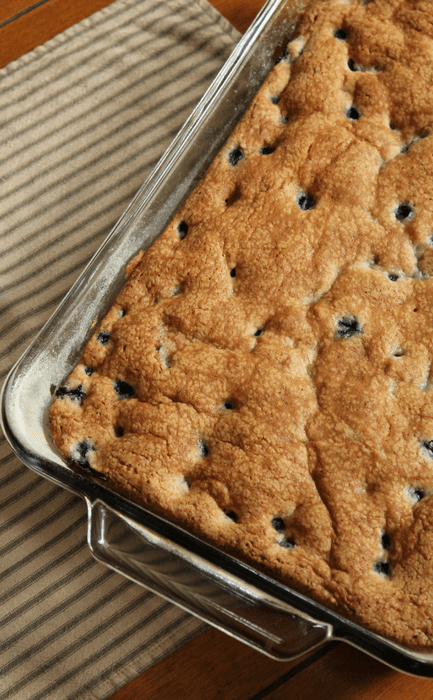 This blueberry sour cream cake recipe comes together so quickly that you won’t mind taking a few minutes to mix it up in the morning to have as an afternoon snack or dessert after dinner. 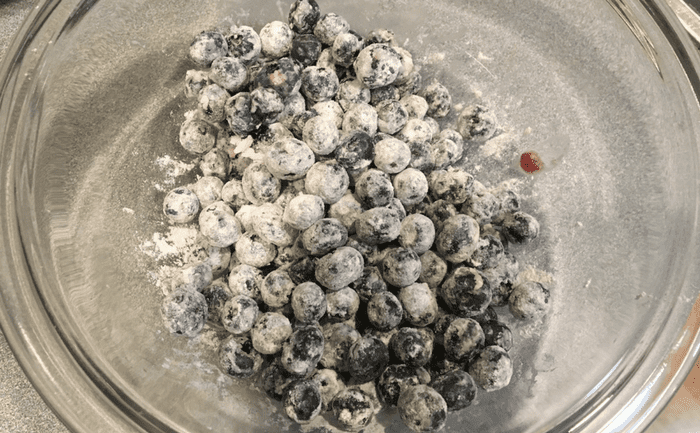 To begin, you’ll want to gather your ingredients together: blueberries, butter, sugar, eggs, vanilla, flour, salt, baking soda and sour cream. 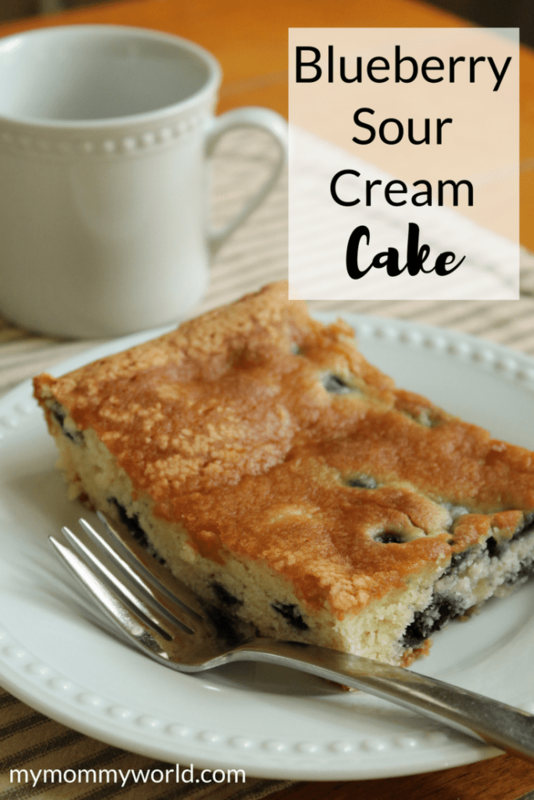 You really want to get a good quality sour cream like DairyPure sour cream for this cake. DairyPure doesn’t load up their sour cream with a bunch of additives and thickeners…it’s made only with fresh cream and milk from their own dairy, where they feed their cows a healthy diet and don’t use artificial growth hormones. 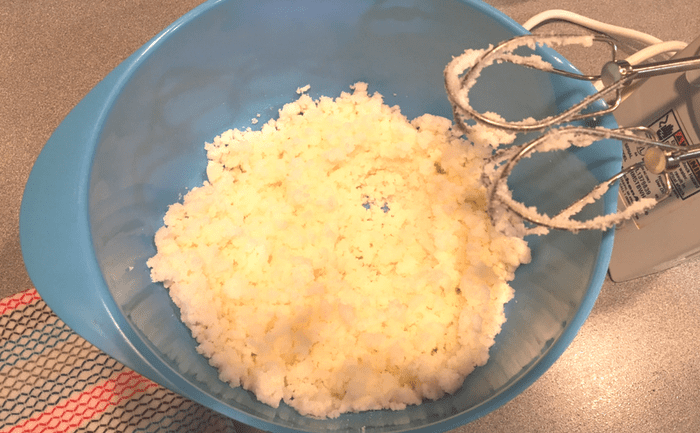 Using an electric mixer, start by creaming the softened butter together with the sugar. Beat until the mixture is light and fluffy. 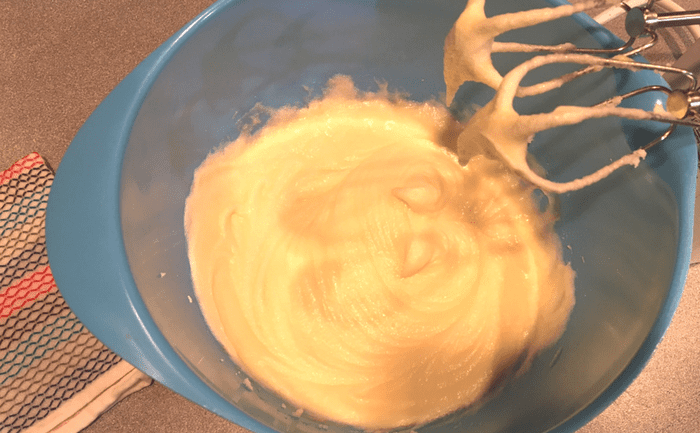 Add the eggs, one at a time, mixing each one into the batter thoroughly. Add the vanilla and mix again. Then you’ll add your dry ingredients to the batter, adding a little at a time, and alternating with the sour cream. 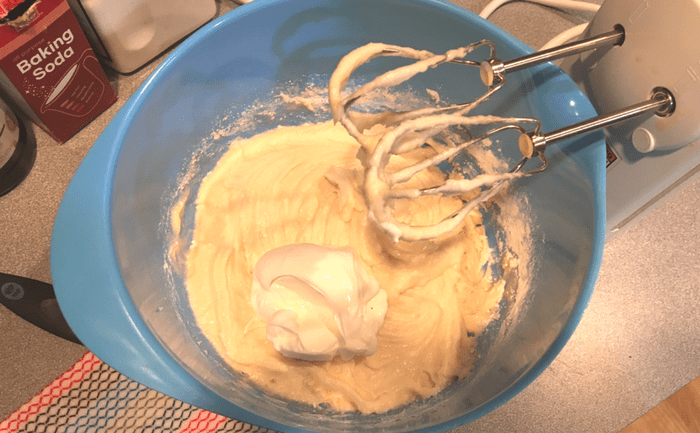 I started with 1 cup of flour, then added half the sour cream, added another 1/2 cup of flour, the rest of the sour cream, and finished with the last of the flour. 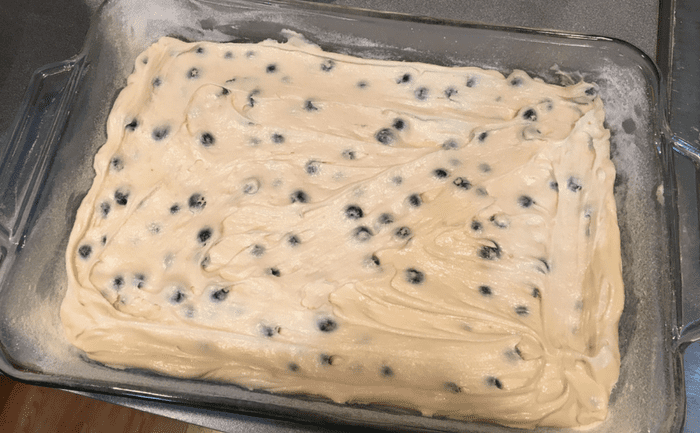 Before you add the blueberries to the batter, you need to coat them in flour in order to keep them from sinking to the bottom of the cake. Just add 1-2 tablespoons of flour to the berries, and toss them with your fingers to completely coat them with flour. When that’s done, just fold them carefully into the cake batter with a rubber spatula to keep them from breaking open. Pour the batter into a greased and floured 9 X 13 inch pan, and bake for 30-35 minutes at 350°, or until the cake is brown on top and a toothpick inserted in the center comes out clean. Cool completely before cutting. I used DairyPure’s All-Natural Sour Cream in this recipe, but it’s also available in a light version as well (which contains 50% less fat and 41% fewer calories). Did you know? The Land O’Lakes Sour Cream is now Dean’s DairyPure Sour Cream, with all the same flavor and texture that families have loved and trusted for years. Add the dry ingredients to the batter, adding a little at a time, and alternating with the sour cream. I started with 1 cup of flour, then added half the sour cream, added another 1/2 cup of flour, the rest of the sour cream, and finished with the last of the flour. 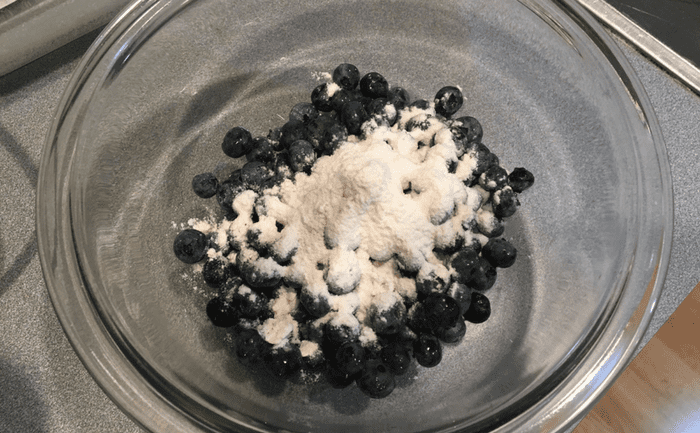 Before you add the blueberries to the batter coat them in flour. Add 1-2 tablespoons of flour to the berries, and toss them with your fingers to completely coat them with flour. When that's done, fold them carefully into the cake batter with a rubber spatula to keep them from breaking open. Win a DairyPure Sour Cream prize pack! How would you like to win some fun kitchen tools to make baking for your family easier? 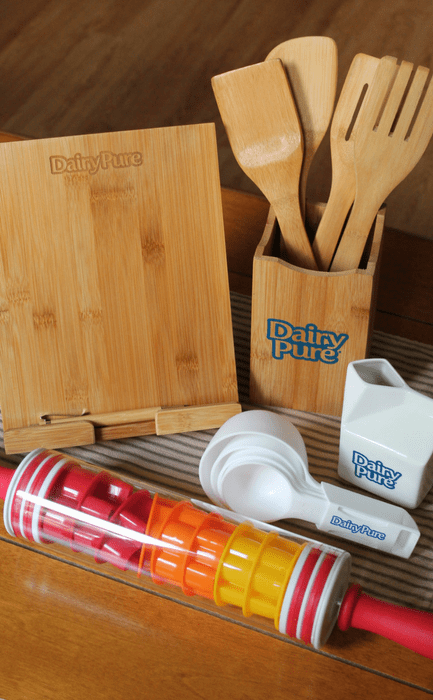 The great folks over at DairyPure have offered to give away one of these fabulous prize packs to a lucky My Mommy World reader! In order to enter the giveaway, just complete the form below. The entry time runs from August 7, 2017 until 12 a.m. Eastern Time on August 22, 2017. At that time, I will select a winner and send them an email announcing their win. If I do not receive a reply from the winner within 24 hours, I will select a new winner. Let me know…What’s your favorite way to eat sour cream? Can you sub the flour with THM baking blend? if so, would it be for 1:1? I like to eat it with tacos. I purchase sour cream to use on taco salad. It makes a creamy and cool topping. My usual favorite way is to use sour cream in a banana pudding but I just tried a new recipe for a hamburger tater tot casserole on Facebook that uses sour cream and its really good. Mmm…the perfect homemade cake! Thanks for sharing on Foodie Friday!